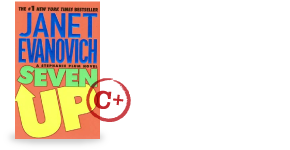 This wasn’t my favorite Evanovich book. I find that each plot isn’t necessarily what makes me like a book or not. I enjoy the side characters and how well I feel that they fit or how well I feel that they interact. I find that Stephanie’s old high school “friends” Mooner and Dougie don’t really do it for me. They don’t feel authentic in any way. And while I realize that most of the characters are meant to be fun and eccentric… the Mooner and Dougie stoners are too much even for me. As a result, I was a bit bored by this one. Stephanie’s life never really is easy, is it? Morelli has proposed, sort of. Suddenly Stephanie is not sure what she wants which seems consistent with her character, but was annoying none the less. Again, Stephanie is after a impossible bail jumper. Eddie DeChooch was once a bounty hunter himself, but is impossible to track down, and once again the bodies start adding up. First Dougie goes missing, and then Mooner, and it looks like they might be linked to Eddie after all. Ranger offers to help, of course, but Stephanie doesn’t trust his motives. To make matters more complicated Stephanie’s perfect sister has returned and her life isn’t so perfect anymore. Die hard fans will like this one, but I found it to be too much. Again, I’d been reading the series pretty regularly and I probably am in need of a break.